Bead, Swarovski® crystals, tanzanite AB, 4mm Xilion bicone (5328). Sold per pkg of 48. Item Number: H20-6003CY Have a question about this item? Tantalizing tanzanite with aurora borealis finish enhances the already remarkable color by adding a reflective quality to the crystal. 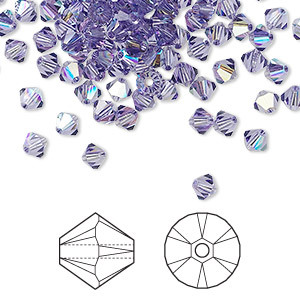 Swarovski crystal components are made in Austria and are considered the finest products of their kind in the world. Bead, Swarovski® crystals, tanzanite AB, 4mm Xilion bicone (5328). Sold per pkg of 1,440 (10 gross). Bead, Swarovski® crystals, tanzanite AB, 4mm Xilion bicone (5328). Sold per pkg of 144 (1 gross).